We are living in a time in which religious identities are daily interrogated. The upcoming election has especially brought religion to the fore in, often in vexed and accusatory rhetoric. Religion’s role in the difficult controversies that have surfaced within recent decades is, needless to say, fraught. Frank, amicable conversation about the nature of these identities and roles might therefore seem infeasible. 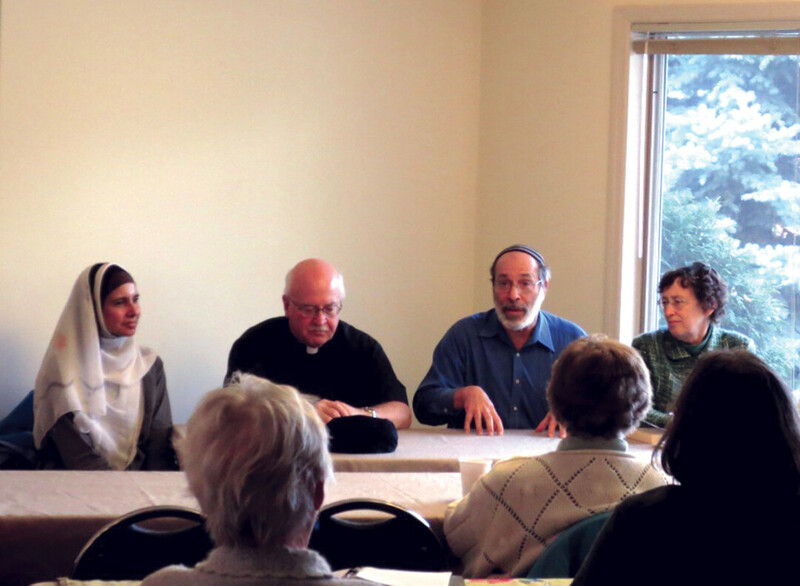 Yet Bozeman’s Interfaith Forum has been successfully fostering such dialogue for nine years. On the first Wednesday of each month, from September to May, six panelists representing different religious traditions convene at Bozeman’s Temple Beth Shalom for a lunchtime panel discussion of pertinent contemporary topics. Four of these panelists are regulars: Father Leo Proxell, Presbyterian Reverend Jody McDevitt, Rabbi Ed Stafman, and Dr. Ruhul Amin, president of the Islamic Center of Bozeman. Two panelists are guests representing other traditions. Each panelist is given five minutes to share his or her perspective, according to his or her representative religion, on the subject at hand. After the panelists have commented, community members are free to ask questions about what has been shared. I met with Rabbi Stafman and Reverend McDevitt to discuss the forum one rainy afternoon in the Rabbi’s office, an inviting space replete with a robust bookshelf, couches, and chairs. Rabbi Stafman--fondly known as Rabbi Ed--leaned back in his chair, feet propped up on another, hands folded across his chest as he listened to Rev. McDevitt share her palpable enthusiasm for the forum. I felt distinctly in the company of friends, and especially of wisdom. The forum’s original intention was to discuss the intertestamental period: namely, what happened between the New and Old Testaments of the Bible. These discussions were focused essentially on the ‘parting of ways’ between Jews and Christians, and explored what made these religious traditions different. While this initially provided space for what Rabbi Ed admits was rather dry conversation, it preceded a philosophical shift in the forum’s intentions. Indeed, the nine years that the forum has been in existence have been fruitful. Typically, the Temple receives seventy to eighty attendees at each forum, which never lacks for rich discussion on topics ranging from gender and sexuality to the role of music in faith traditions. This is testament, according to Rabbi Ed, to the remarkably diverse and inspiring community here, one principally invested in listening and learning about extremely pertinent subjects as viewed through distinct lenses. The relevance of an interfaith forum today was evident in Rabbi Ed’s and Reverend McDevitt’s vehemence. They admitted no challenges presented thus far in this forum, merely the recognition that the monthly gathering has primarily cultivated a space of inspired dialogue rather than action. However, both leaders spoke to the forum’s burgeoning understanding of action, and its necessity, as it relates to the subjects discussed. The forum has discussed Syrian refugee resettlement and supports events that foster bridges of understanding between traditions, such as a recent Get to Know Your Muslim Neighbor Day. Rabbi Ed referenced the Gallatin Valley Interfaith Association as more action-focused in its mission. The Interfaith Forum is nonetheless part of an international movement invested in the bridging of cultural and religious traditions, one promoted primarily by the United Religions Initiative (URI), an organization that links thousands of interfaith communities across the United States. Recently, thirty Bozemanites attended the Parliament of World Religions in Salt Lake City, at which eighty religious traditions convened. Both leaders described this experience as humbling. The message was clear: interfaith dialogue is nationally and individually valuable. Rabbi Ed described the two Messianic visions of the Bible: one, elaborated in the book of Ezekiel, anticipates a time when swords turn into ploughshares, resulting in peace and community. The other, described in Isaiah, identifies a terrible war, a time of destruction and brutality towards the Other, as a means of achieving peace. The Interfaith Forum will have its next discussion on “The Power of Words” on November 2, 2016 at Temple Beth Shalom. Attendees are encouraged to bring their lunches, provided they are free of shellfish and pork. Those interested in future discussions are welcome to investigate the forum’s website at http://bethshalombozeman.org/community/bozeman-interfaith-forum.